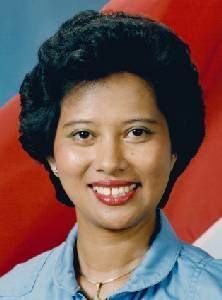 Indonesian biologist payload specialist astronaut, 1985-1986. Microbiologist. Later research scientist at the University of Dyakarta. Advisor for Bandung Institute of Technology. Status: Inactive; Active 1985-1986. Born: 1952-07-31. Birth Place: Sanduko. Doctorate degree in genetic engineering. Family: Astronaut. Country: Indonesia. Flights: STS-61-H. Bibliography: 4452, 6076.